This is my largest print to date. It measures 10" by 10" by 3" and was printed in two parts that took more than 24 hours each. Even so, it is still just the front half of the teeth of an orca whale. I found several people online took photos of the same orca skull in a museum, and was able to use all those photos to reconstruct the positions of the teeth, since each photo had a different angle. Unfortunately, I haven't found any CT scans or the like, which might have given me better quality data, so the jawbone here is pretty simplified. I initially used that model to create a 3D whale model for rendering in Carrara, but I wanted to see what it would look like at full scale, so I printed it. 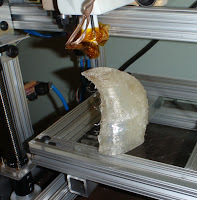 I printed the first part in November, and it had some rough spots in the overhang area. A few weeks ago, I printed the second half, using what I've learned since then, and the result is much nicer, except it got stuck a few times, so I had to restart it in the middle. I printed a whale tooth I found on Thingiverse: (Whale Tooth) because I thought it looked cool and would really test the capabilities of my machine and software tools. (Which is great for working out the kinks.) I'm happy to report success! The RepRap java tool couldn't handle the STL file, so I used Skeinforge. to create the GCode. I had to customize Skeinforge a bit before it worked right. It wanted to send Z moves in the same line as an X-Y move, and that clashed with the different speeds required. It still doesn't do acceleration right, which messed up a few layers when the X stepper skipped a few steps. The latest change to get things working is I added a bunch of Kapton tape around the washer so it stops acting like a heatsink. I found that the PLA was cooling too much, (especially when it stopped while moving between layers after the extruder was warm,) and creating a plug in the top half of the welding tip. If I pulled out the filament, the portion between the pinch wheel and in the PTFE was a little stringy (it would stretch as I pulled) but the part below that, in the area of the nut and washer, was a perfect 3mm cylinder, which terminated in the really melted part. And here's my first success with PLA! It's a small stand for my Droid phone, which holds it in portrait position. It fits a bit tight, but that's because I haven't had a chance to calibrate the extruder settings. It finished, with only a little help here and there. Success! Now on to fine-tuning. But first, some sleep. As I write, I'm printing layer 7 of my best print so far.. Here's hoping! I added Kapton tape to insulate the big washer that mounts the heater to the extruder, so it doesn't cool down so much. I'm extruding at 200C, with some minor back slipping of the stepper, but it's extruding pretty well.